Today, Microsoft announced a new framework that enables businesses to adopt blockchain technology for increased enterprise privacy and security, and named Intel as a key hardware and software development partner. As part of this collaboration, Microsoft, Intel and other blockchain technology leaders will build a new enterprise-targeted blockchain framework – called the Coco Framework – that integrates Intel® Software Guard Extensions (Intel SGX) to deliver improved transaction speed, scale and data confidentiality to enterprises. This first-of-its-kind innovation accelerates the enterprise readiness of blockchain technology, allowing developers to create flexible and more secure enterprise blockchain applications that can be easily managed by businesses. Blockchain is a digital record-keeping system where digital transactions are executed, validated and recorded chronologically and publicly. Because it’s decentralized and transparent, it increases the efficiency and security of financial transactions – and does so at a significantly lower cost than traditional ledgers. The technology can be used for everything from simple file sharing to complex global payment processing and has the potential to transform the way companies operate. Intel, Microsoft and other blockchain technology leaders are working together to deliver security-enhanced, scalable capabilities in blockchain services. The Coco Framework uses Intel SGX to add new levels of privacy and confidentiality to blockchain transactions. 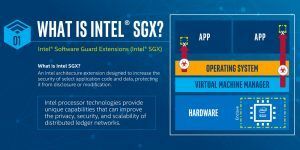 Intel SGX is a hardware-based security technology that can help improve blockchain solutions by providing a trusted execution environment that isolates key portions of a blockchain program. Intel SGX consists of a set of CPU instructions and platform enhancements that create private areas in the CPU and memory that can protect code and data during execution. Intel SGX helps the Coco Framework provide confidential data and accelerated transaction throughput. The data confidentiality is achieved by encrypting sensitive blockchain data until it is opened in an Intel SGX enclave by a permitted program. The accelerated throughput is achieved by isolating the transaction verification process to speed network consensus. Intel is an active participant in the blockchain revolution, participating in developing standards, actively contributing technology and providing expert insight. Intel is actively engaged with industry leaders to improve performance, reliability and scalability of blockchain technologies. Intel® Xeon processors provide unique capabilities that can improve the privacy, security and scalability of distributed ledger networks. For example, the recently-announced Intel® Xeon Scalable processors include a range of hardware-based trust, key protection and crypto-acceleration features that increase blockchain security and performance.